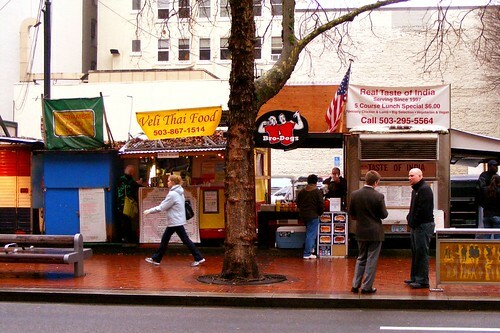 Food carts, like these in Portland, can actually draw more customers to brick-and-mortar restaurants. Sligo at the Singular worries that food trucks in downtown Silver Spring are taking business from restaurants in actual buildings. Is this a valid concern? Maybe not. Like I wrote last spring, food trucks are a way to fill retail gaps, figuratively and literally. Successful food trucks are ones that offer something that brick-and-mortar restaurants currently don't. They're also ways to draw hungry customers to areas of downtown Silver Spring that haven't finished developing, which could help the restaurants already there. Right now, Ellsworth Drive between Fenton and Georgia is the only block in Silver Spring that has shops and restaurants lining it uninterrupted from end to end and on both sides. If I'm an office worker looking for a place to eat lunch, where will I go first? Probably the block where I have as many choices as possible. I might go to Potbelly today, but tomorrow I'll want to try something new an d go to Chick-Fil-A, and so on. As a result, all of the restaurants benefit from the presence of other restaurants. Many downtown blocks, however, have only a handful of shops or none at all. 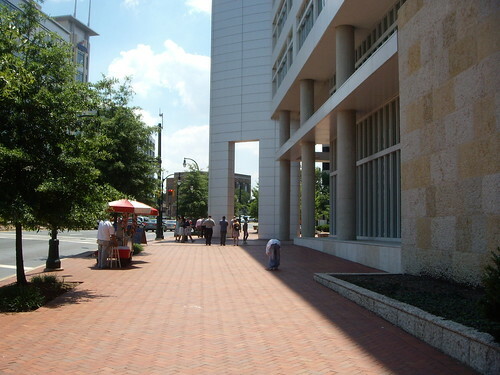 Discovery Communications didn't include a cafeteria in their headquarters on Georgia Avenue so workers would support local restaurants, but their building doesn't have any retail on the ground floor, making the sidewalks dead. Meanwhile, popular restaurants like Jackie's have trouble drawing customers because they're too far away from other stores or restaurants for people to drop by on a whim. Sligo suggests Skew Works, the new restaurant on Wayne Avenue, could lose business to a food truck that's started parking outside. But there's only one other restaurant on that entire block! Skew Works isn't losing customers to the food truck. They're losing customers to streets with more dining choices. Restaurants want to draw more customers. 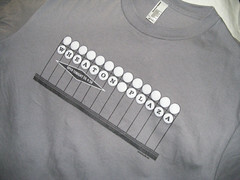 We want to create more street activity in downtown Silver Spring. Food trucks seem like a way to kill two birds with one stone. They're a relatively new addition to Silver Spring, and it's likely that they'll move around until finding locations that work well for them and for customers. But I don't think they'll hurt existing businesses. With thousands of people living, working and passing through the area each day, there's no shortage of hungry people looking for places to eat. They just need to know where to find them. 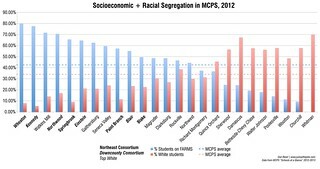 Unfortunately I cant weigh in on this discussion because although I live in SS I don't work here. What I would like to see are a few more community events, like the jazz festival last Summer, when a number of brick and mortar stores rolled out their food trucks/carts. There are a number of places serving up delicious eats but are a little out of the way.